Earthquakes occur throughout the world with unknown frequency and potentially devastating effects. 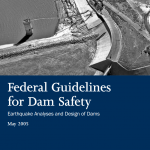 Due to the consequence of their failure, seismic evaluation and design should be included when determining the location and design of a new dam or reviewing the design and function of an existing dam. 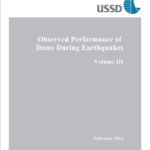 The dam type, resiliency, and redundancy in a seismically active area should have a role in the evaluation process. Earthfill, rockfill, and concrete gravity dams typically perform better under seismic loading because of the nature of their makeup. Though these dams are inherently more resistant, that does not make them immune to the effects of earthquake loading. Designers must consider the potential impacts earthquakes may have on a structure and include defensive design measures to counteract the damage and prevent catastrophic failure. Fujinuma Dam was overtopped by the reservoir during the March 2011 Tohoku earthquake leading to complete failure. Photo is looking from the left abutment to the right abutment across the breach. (Photo source: the Dam Association of Japan, Fujinuma Dam – Dam Handbook). 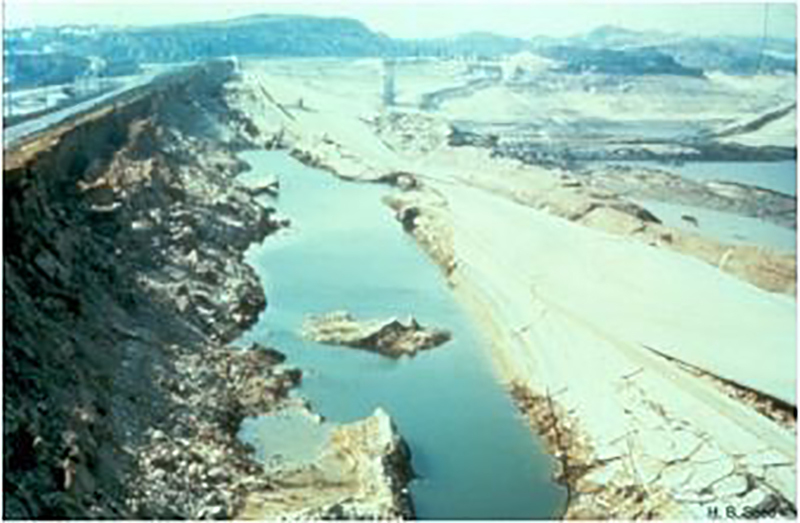 settlement and cracking of a dam leading to internal erosion and enlargement of cracks until failure ultimately results. During earthquake shaking abutments and foundations may shift and move allowing the dam to tilt, rotate, or slide and lose structural integrity. 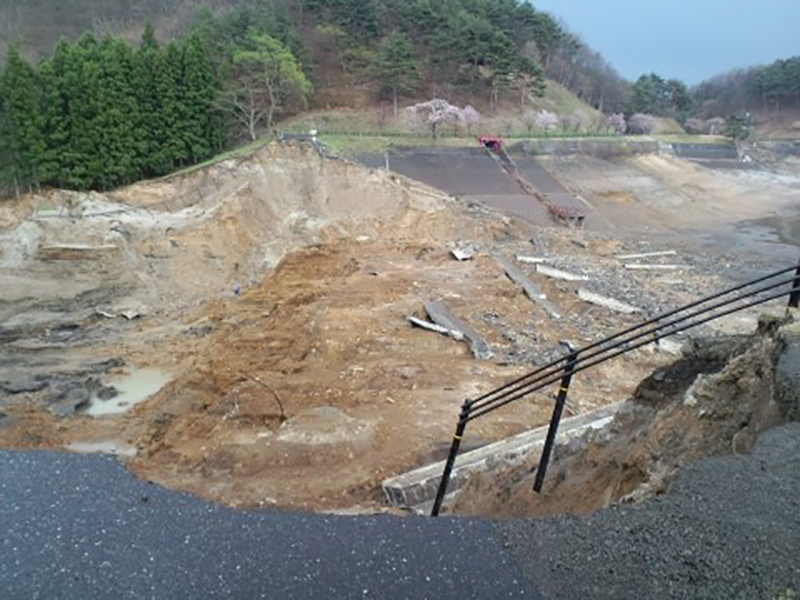 Slope failures on or near the dam may allow the reservoir to overtop the dam or failure material to block spillways and outlets. 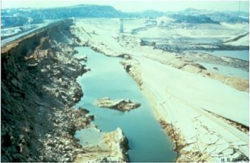 Often the failure of a dam under seismic loading is attributed to a combination or sequence of the above circumstances. Defensive design measures should be included to minimize or mitigate the effects of earthquakes. The designer should ensure that seismic loading has been considered during the concept phase. When identifying the location for a proposed project the seismic activity of the area should be investigated to determine the need to consider seismicity in the elements of design. The construction of the dam and material types should be evaluated. When constructing earthen embankments, well compacted soils with some plasticity or rock fills will perform better under seismic loading than granular soils. This should be given particular attention when evaluating existing structures that may not have been built to today’s standard of practice. Compacting at optimum moisture or slightly above will help the embankment to be more flexible under seismic loading. When embankment materials are compacted dry of optimum they become more brittle, a characteristic that leads to cracking. Foundation conditions for dams should be investigated and any necessary improvements considered. In some cases over-excavation of loose sandy materials has been necessary to remove the possibility of liquefaction. Cutoffs to minimize seepage may be considered to provide additional strength to downstream shells by reducing saturation. 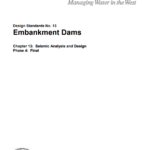 Key features that are becoming standard for embankment dams are chimney and blanket filters and drains. These design features serve both to lower the phreatic surface through the dam and act as a crack stopper, preventing internal erosion through cracks. Core sections can be flared at abutments to provide additional width at these critical contacts. A designer may opt to provide additional design freeboard thereby reducing the likelihood of overtopping due to deformation or settlement of the crest. 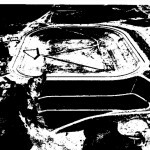 Reservoir slopes can be flattened or stabilized if there is concern of slope failure or rock slides into the reservoir. The design of spillways and outlets should include a seismic evaluation to minimize damage to all critical appurtenances. 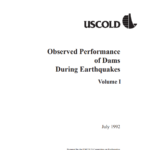 With the potentially catastrophic results of a structural dam failure or uncontrolled loss of reservoir, seismic evaluation must be considered in the design of these structures. The seismic activity near the location of a dam should be determined during the concept phase of a project and the necessary defensive design elements included as the project moves forward. Consideration should be given to location, layout, materials and design features to minimize the effects of seismic loading. (1) Seed, H. Bolton. (1981). Earthquake-Resistant Design of Earth Dams. International Conferences on Recent Advances in Geotechnical Earthquake Engineering and Soil Dynamics. (2) Sherard, James L. (1967). Earthquake Considerations in Embankment Dam Design. Journal of the Soil Mechanics and Foundations Division. 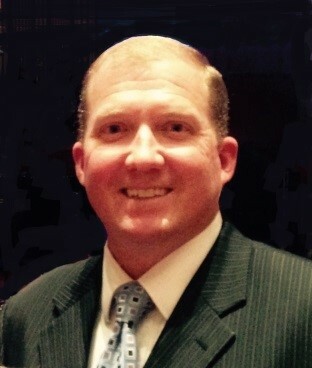 American Society of Civil Engineers. This lesson learned was peer-reviewed by David W. Sykora, Ph.D., P.E., G.E., Exponent, Inc.
Lower San Fernando Dam, 1971. 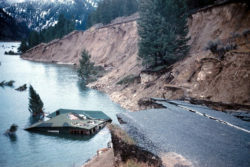 Approximately 1800 feet of the embankment (including the parapet wall, dam crest, most of the upstream slope, and a portion of the downstream slope) slid into the reservoir as a result of liquefaction of the hydraulic fill on the upstream side of the embankment. (Photo source: E.V. Leyendecker, U.S. Geological Survey ). 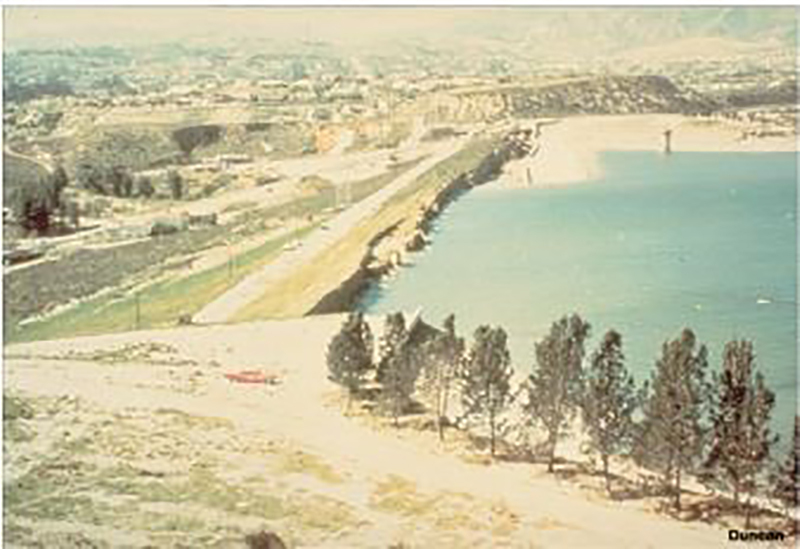 Upstream slope of the Lower San Fernando Dam, 1971 (Photo source: Ross W. Boulanger, UC Davis). Upstream slope of the Lower San Fernando Dam after the reservoir was drawn down, 1971 (Photo source: Ross W. Boulanger, UC Davis ). 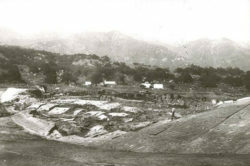 The Sheffield Dam, located at the base of the Santa Ynez Mountains at the northern end of Santa Barbara. The dam was built on sandy soil which liquefied during the 1925 earthquake. 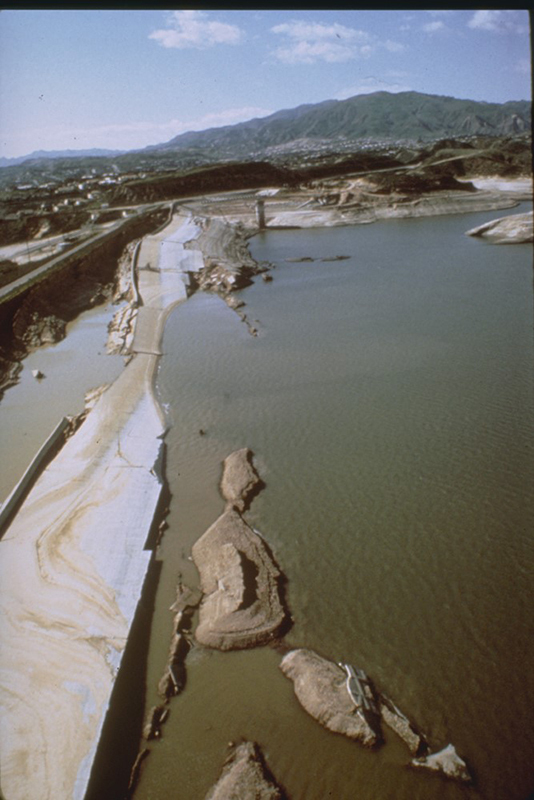 The center of the dam, about 300 feet of it, simply floated away on the liquefied soil, traveling about 100 feet downstream (Photo source: EERC at UC Berkley). Video from the United States Forest Service that tells the story of the Hebgen Lake Earthquake. 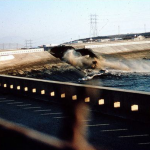 Footage of the San Fernando Dam after the 1971 earthquake. Footage of the Fujinuma dam after the 2011 earthquake.